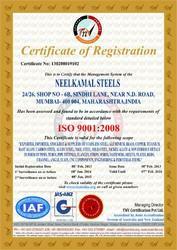 Neelkamal Steels is a trusted Manufacturer, Wholesaler, and Exporter of Austenitic Steel, Ferritic Steel, Duplex, Nickel Alloys, Titanium, Non-Ferrous Metal etc. With the focus on exports, we have been maintaining a balance between quality of our products and price acclaimed for innovation and market handling techniques. Trading of Pipe Fittings, Flanges and Fasteners. Neelkamal Steels believes in building customer satisfaction by continually meeting our customer needs better than our competitors at a better cost, not price. Deal with customer inquiries efficiently and courteously at a consistent competitive market price. Where supply is a problem, use our worldwide market knowledge to offer a product which will meet our customer needs. Supply quality products as per the standards required. Support suppliers whose service and product consistently meet our requirement. Deliver with the shortest lead time, on time, right the first time. Continually improve our service to stay ahead of our competitors. We maintain strict quality codes in our organization through an effective Total Quality Management system. The products are procured from reliable vendors after their position in the market has been scrutinized by our professionals. All the products are quality tested in our self-contained unit with forming, forging, welding, machining, heat treatment, and facilities for physical & chemical testing. These products also have to satisfy the quality standards of various government recognized laboratories with an IBR Test Certificate under Third Party Inspection Like EIL, TCE, MECON, PDIL, BACOUNCIL, BV, FEDO, UDHE, IBR, DNV, H & G, M.N.DASTUR & CO., DPG, BUREAU VERTIAS, ICB, IRS AND TPL. With the support of our professionals, we have been able to cater to the clients with a premier range of products that conform to the quality standards of the industry. These professionals understand that building a cordial relation with the clients is imperative in the modern day scenario. We owe all the credit of our success to our team of diligent professionals that contribute to the smooth operations of our organization. These professionals have vast industry experience and pools of knowledge. They also understand the need to maintain cordial relations with our clients. We have gathered a vast client base throughout the globe owing to our quality ridden products. We believe that in order to retain our position in the industry in the present day scenario, we need to understand the needs of the industry even before the actual demand arises. For this reason, we study the varying industry demands over a period of time and maintain constant communication with the clients for their feedback.